One of the storylines coming out of last night’s surprise loss by Republican Rep. Eric Cantor was that the immigration issue was a major point of weakness for the House majority leader. More specifically, Cantor’s relatively conservative stance on immigration reform was viewed as not conservative enough for the Tea Party base within his party. Yet a Pew Research Center survey, conducted Jan. 23-Feb. 9, shows that most Americans favor a path to citizenship for undocumented immigrants, though there are partisan and ideological differences over the issue. Nationwide, 76% say people currently in the country illegally should be eligible for citizenship if they meet certain requirements, and just 23% disagree. Among Republicans, that majority slips to 66% vs. 32%. And narrowing further to Republicans who agree with the Tea Party still finds a 59% majority in favor of a path to citizenship for undocumented immigrants, and 39% opposed. There is an intensity of opinion among immigration reform opponents that provides important context: Opponents of immigration reform see the issue in stark terms. When asked a follow-up question, most of those who oppose a route to citizenship for undocumented immigrants go a step further and say there should be a national law enforcement effort to deport all immigrants who are now living in the U.S. illegally. Nationwide, 17% of Americans hold this view, including 25% of Republicans and 31% of Tea Party Republicans. The relatively low turnout in party primaries is another key factor, and the most active Republicans tend to be more conservative across a wide range of issues. But these differences are modest. Roughly a third of Republicans tell us that they always vote in the congressional primaries in their district. 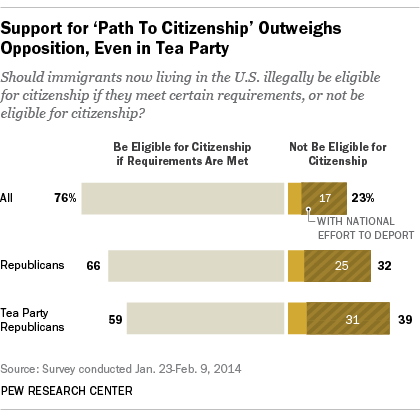 These consistent GOP primary voters support a path to citizenship by 62% to 36%. Most of the opponents – though just 29% of GOP primary voters overall – favor deportation. What’s the prevailing view on immigration among Tea Party Republicans who “always vote”? This is certainly the most conservative segment of the public on the immigration issue, but even here the issue divides, rather than unifies. Tea Party primary voters are divided 52%-46% over whether they support or oppose a path to citizenship for undocumented immigrants, with 37% saying they would go so far as to support a national effort to deport. Nationwide, the trend over the past 20 years has been toward embracing immigrants, not rejecting them. Since 1994, we’ve asked people whether immigrants “are a burden on our country because they take our jobs, housing and health care” or “strengthen our country because of their hard work and talents,” and the trend has been decidedly toward the latter. 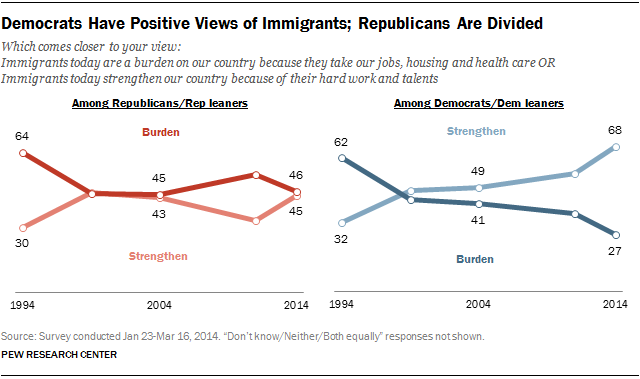 Currently, 57% see immigrants as a benefit to the nation, and just 35% a burden. Ten years ago, opinion was divided (45% strengthen, 44% burden), and in 1994 opinion ran the other direction (31% strengthen, 63% burden). Democrats, once deeply divided in their views of immigrants, today have increasingly positive views of them. Republicans, who were negative toward immigrants 20 years ago and were divided a decade ago, remain divided today. So did Eric Cantor lose his seat over his immigration views yesterday? It’s not clear what specific or general message Virginia voters were sending to Washington. But the survey finds that nationally only a minority of Republican voters take a hard-line stance on this issue. Immigration may well have been a symbol of a larger concern among some Republicans about the direction of the nation, and how much Republican leaders should compromise on important national issues. More broadly, the data show why legislative action on immigration reform continues to face a difficult path. While the balance of public opinion – across party lines – favors immigration reform of some sort, the intensity of feeling among those who are opposed creates a strong roadblock to action.